It was a June wedding in Paris. Multi-millionaire Isaac Merritt Singer, 52, was marrying the very young, the very pregnant French model, Isabelle Eugenie Boyer, 22. The baby, born the next month, would be Isaac’s 19th child – or maybe the 21st – or…? But who’s counting? Isaac was the Singer of Singer sewing machines. Really an actor at heart, Isaac dabbled in inventing. When someone asked him how to make sewing machines work better, it took Isaac eleven days to come up with some ideas. At that time, a superb seamstress could sew 40 stitches a minute. A cumbersome, hard to operate sewing machine could sew about 150 not-too-straight stitches a minute. 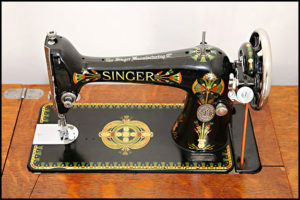 Singer patented his ideas and produced a machine that could sew 900 locked stitches a minute in a straight line. Using ways to produce them efficiently, Isaac made sewing machines that eventually sold for $10, not $300 or even $100. A group, not including Elias Howe (the inventor of the sewing machine) met in Chicago in 1856, intent upon suing each other. Instead, they decided to work together, and give Howe a royalty on every sewing machine. Using the idea of a small deposit and buying on time, plus accepting trade-ins, Singer would eventually capture 90% of the market worldwide. And get very rich. Before his sewing machine success, Isaac had made some money on a patent for a rock drill. With his profit, he set up an acting troop called Isaac Merritt Players. 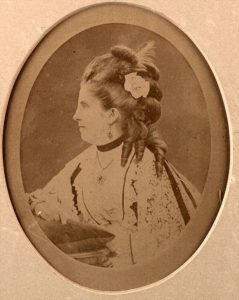 Acting with Isaac was Mary Ann Sponsler, billing herself as Mrs. Merritt. There was a real Mrs. Singer – Catharine Haley Singer – and she and Isaac had two children. 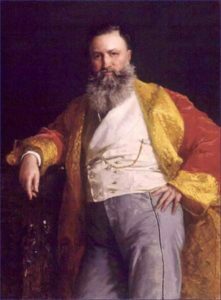 With Sponsler, Singer had ten more children, or maybe twelve. He and Catharine divorced; the grounds were adultery – against Catharine! 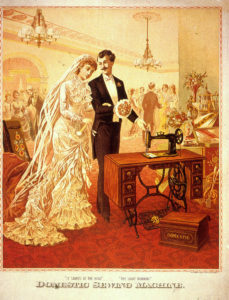 Although Singer and Sponsler did not marry, they lived as husband and wife in his New York City mansion – until she caught him with one of his sewing machine factory workers, Mary McGonigal. By that time, McGonigal had already given Isaac five more children. Sponsler sued him for bigamy. Isaac was jailed, bonded out, and fled to London with McGonigal. The aftermath of the bigamy charge was that another “wife” came forward, Mary Eastwood Walters. She and Isaac had one daughter. The divorced Isaac did not marry Sponsler, Walters or McGonigal. So when he fell in love with Isabelle Eugenie in Paris in 1863, he was free to marry her. Which he did. Together, they had six children, the last one born in 1870, when Singer was 59. With the fortune generated by his sewing machine company, Singer had the means to take care of all the sowing of his wild oats. In the end, Isaac named 22 children in his will, left his fortune to them and Isabelle, and left them all to fight over it. Thank you. Wow! 22 vintage Singers is impressive! They are beautiful machines.